A great idea to surprise DAD this Fathers Day with Sour Cream Apple Pancakes! So enjoyed my time with Msgr. Jim, host of Telecare's Real Food chatting up my features from GHL and all my creative friends! 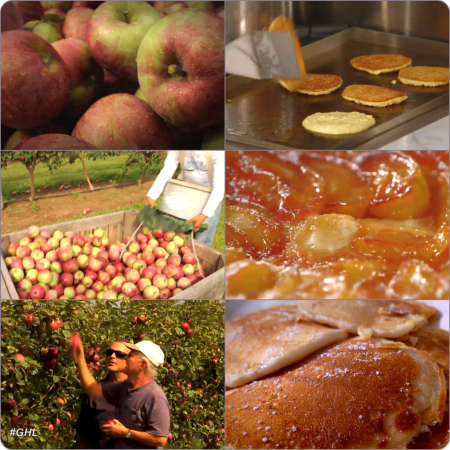 Enjoy my apple pancake recipe inspired from fresh picking..
Pancakes are one of the earliest forms of bread and are served up geographically in different ways. Be all traditional with baking powder, or try prospecting with sourdough pancakes like the early pioneers. Flip ‘em with oatmeal or buckwheat when in Vermont; or for a Dutch Style treat serve with lemon, powdered sugar and jam. In a large bowl, mix together well with a whisk all dry ingredients the flour, baking powder, salt and sugar. In a separate bowl mix all wet ingredients the sour cream milk, vanilla, egg and melted butter. Yes, use two bowls so the dry and wet ingredients blend better when combined. Add the wet to the dry and just strip with a large spoon or spatula until the dry ingredients have absorbed the wet. There may still be a few lumps, hats OK. Do not over mix, or pancakes will become tough. Check consistency of batter with a sample test pancake, if too think adjust with a few drops of milk. Pour one 1/4 cup scoop of batter onto the griddle for each pancake. Add apples at this time. You will begin to see bubbles form on the top side when brown on bottom, flip and brown on second side. Serve hot with syrup or favorite topping eaten immediately right off the griddle. Finish off your stack with honey, molasses, can syrup, Nutella, or Maple Syrup. Top with toasted nuts and powder sugar. If serving apple pancakes for dessert sprinkle a small amount of cinnamon sugar on top of sliced apples prior to flipping. Note: After peeling apples maybe chopped or sliced thin depending on your own preference and taste. Chopped apples can be added to the batter or placed on top of raw side of pancake while on the griddle. Sliced apples should nay be arranged on raw side of pancake while on griddle before flipping. And If making batter ahead the night before, add apples just before cooking. Tip: When using double acting baking powder (the most common available today) prepare my batter the night before, cover bowl and refrigerate. This not only saves time but more importantly allows the gluten to relax from mixing the batter, which makes for a more tender pancake. When you are ready to cook pancakes just gently stir the batter, do not mix too much or they will be tough. Test Your Baking PowderHow old is your baking powder? Replace baking powder every 6-12 months after opening. The exact amount of time is determined by how much moisture gets into your container of baking powder. Do you immediately recover the cap; as you should, or do you leave the top off and cover it later when cleaning up? Store in a cool dry place.